The Peace with Jordan could only potentially last for three generations of Abdullahs (Avimelekhs). Just as it was with Avraham and Yitzchak with the ancient Philistines. The first Abdullah was assassinated either at Al Aksa or the Golden Dome in the early 1950s because he wanted to make Peace with Israel. The state of Israel was born in 1948 just as Avraham had been born in 1948 from Adam's sin. The second "Abdullah" was certifiably insane so that his son Hussein, the 3rd Avimelech became king for a long long reign. Eventually after the 6 Day War he repented and signed a peace treaty with Yitzchak....Yitzchak Rabin just as Yitzchak Avinu signed a second peace treaty with the 2nd or 3rd Avimelech in the Torah. Yet this Avimelech Peace Treaty with the Avot was only for three generations of Avimelech. Look at the Torah to see what was pledged with Avraham. So now with the fourth Abdullah/Avimelech the Peace Treaty is null and void. This is of course my greatest hope. Yet, we have a Linguine Spined Prime Minister who might make this post obsolete by sunrise on the 2nd of Av. As it should be obvious to the world, he has NO Emunah or Bitachon with which G-d could potentially strengthen his backbone because frankly, Bibi has no backbone to speak of unless you think that a wet noodle has a backbone. The Caver in Chief has made a career for the last 20 to 25 years out of caving before pressure. He will not lead Israel into battle against the forces of evil unless HaShem plays tricks on him forcing him to stand strong or literally lose his life for being a coward. When the Malbim and others postulated that the last PM of the lowly pre-Messianic State of Israel prophesied in Zecharia 12 would have the precise Yichus of Bibi Netanyahu (which he does, believe it or not) and would be Mashiach ben Yosef, the PM pierced with a dagger by Armilus at the Gateway to Yerushalayim, they likely had not met a member of the secular Judenrat like Bibi. Yichus and all he is about as low as you can get...., until you start to examine his competition in Labor and Yesh Atid. It seems to me that G-d is going to have to do it Himself without Bibi providing the "stirring from below" since the one posing as Mashiach ben Yosef as PM is a poor excuse for a leader even if he is 1000 times LESS poor than the electable alternatives. ... End of Rant. So we all might ask, Why isn't Avimelekh in Gaza near the Gerar Wadi as he was in ancient times? Why is Avimelekh in Jordan? Well for this we need that commentary by the Targun Yonatan ben Uziel. We know from his peirush on Devarim 34: 1-3, that the Pshat is that Moshe saw closest to him while he stood on Mt. Nebo in Jordan which overlooks the northern tip of the Dead Sea, Yericho the City of Date Palms. The Targum Yonatan waxes poetically about how this city called Qiryat or Qirvat Dekaliya would be evacuated by 200,000 of its fellow Jews. Now almost everyone might think that this City of Date Palms is Yericho since, the actual text of the Torah says that Yericho is the City of Date Palms (Tamarim in Hebrew and Dekaliya in Aramaic). Now in his commentary on this verse he does say that the Squatters in the Jewish heartland of Yehudah and Shomron would be from Ammon (as in Amman) and Moab in Yarden and that there would also be a large terrorist army in the "Maishra", the marshlands of Gaza. He doesn't mention that the majority of those in Gaza would have the last name Masri which means Mitzri which means Egyptians, but he does say that Qirvat Dekaliya would be evacuated by its fellow Jews. What is curious is that the entire evacuation in 2005 (5765) was in Gaza and the Northern Shomron and that the largest populated city that was evacuated was Newe Dekalim, the Beauties of the Date Palms, and that this city was in Gaza, not near Yericho! So here we see that the entire prophesy of Moshe, as described by the Targun Yonatan, that we thought would apply to the Plain around Yericho ended up applying to the Maishrah, the marshlands of Gaza! So if that is the case, the endtimes places were spiritually switched. The City of Date Palms at the end of days was in Gaza, and the Avimelekhs are in Yarden. Why? Let me think about it. כב וַיְהִי, בָּעֵת הַהִוא, וַיֹּאמֶר אֲבִימֶלֶךְ וּפִיכֹל שַׂר-צְבָאוֹ, אֶל-אַבְרָהָם לֵאמֹר: אֱלֹהִים עִמְּךָ, בְּכֹל אֲשֶׁר-אַתָּה עֹשֶׂה. 22 And it came to pass at that time, that Abimelech and Phicol the captain of his host spoke unto Abraham, saying: 'God is with thee in all that thou doest. According to your Torah understanding, what was all of that insanity in the Temple Mount, sarting with the murder of two kenites (Druze)... davka during the three weeks!?!?!?! They pulled back the metal detectors?! Ginno: I commented in full in the Comments section of the previous post. Click on the previous post. At the bottom of the "Post" page, Click on Post a Comment. Then click on Newer or Newest for the last bunch of comments. I will repost it all in a few days, but until then you can see what I wrote. א וּמֹשֶׁה, הָיָה רֹעֶה אֶת-צֹאן יִתְרוֹ חֹתְנוֹ--כֹּהֵן מִדְיָן; וַיִּנְהַג אֶת-הַצֹּאן אַחַר הַמִּדְבָּר, וַיָּבֹא אֶל-הַר הָאֱלֹהִים חֹרֵבָה. 1 Now Moses was keeping the flock of Jethro his father-in-law, the priest of Midian; and he led the flock to the farthest end of the wilderness, and came to the mountain of God, unto Horeb. ב וַיֵּרָא מַלְאַךְ יְהוָה אֵלָיו, בְּלַבַּת-אֵשׁ--מִתּוֹךְ הַסְּנֶה; וַיַּרְא, וְהִנֵּה הַסְּנֶה בֹּעֵר בָּאֵשׁ, וְהַסְּנֶה, אֵינֶנּוּ אֻכָּל. 2 And the angel of the LORD appeared unto him in a flame of fire out of the midst of a bush; and he looked, and, behold, the bush burned with fire, and the bush was not consumed. The first commandment in the Torah dealing with building the mishkan IN PARSHAT YITRO is to erect an altar of whole stones and IRON TOOLS should not be used to hew stones on that altar! Why? because according to Chaza"l iron shorten life, and the Mizbeach is being made to offer of Qorbonot that lengthen our lives! So in our parallel, the mountain of the L-rd is no longer Sinai. The Mountain of the L-rd is now the Temple Mount. I guess that Bibi does not want to turn aside to concentrate on the sublime marvel of the Burning Bush and the open miracle of the self-exile of the Muslims from the Temple Mount. He is spiritually opaque it seems. Wow. The Security Cabinet voted to remove metal detectors AFTER Greenblatt arrived in Israel smooth things over. Only Naftali Bennett, Ayelet Shaked, and Zeev Elkin voted against this cowardly move. Not only do the remove the metal detectors but also ALL security cameras. So until the advanced monitoring system costing 100.000 ILS will MAYBE installed the path is void of protection. And the Waqf has already announced that they will not accept any security system. A brave government we have and the PM is bragging about his personal achievements solving the crisis. There are removing the cameras as well according to arutz sheva. This OS insane. I think I am going to be sick.... Sorry folks, I am taking the rest of the day off. The director of the Policemen's Wives organization, Avigayil Serara, said that she doesn't know how widespread the refusal to serve in such places is but said that many policemen had expressed their reservations and their families were also concerned about the security arrangements for policemen at the site. Serara said that due to the sensitivity of Temple Mount and the fact that police had been murdered there in cold blood, it is imperative to give them maximum protection. Watch out Jews of America! Anti-Semitism is growing fast and closing in on your neighborhood. The Zionist Organization of America(ZOA) is demanding that US Secretary of State Rex Tillerson resign due to anti-Israel language in the State Department’s annual terrorism report. The State Department report partially attributes terrorist violence to “lack of hope in achieving Palestinian statehood, Israeli settlement construction in the West Bank,” and other Israeli actions, including aggressive Israeli military tactics. The ZOA claims that the language was not included in last year’s edition of the report. Bibi is still genuflecting to Eisav/Edom (US Friedman, Greenblatt, Kushner, and Co.). How in the world are they going to remove all the other arms/ammunition from on the Mount? The only solution is an earthquake! Reb Dov, what you see and wrote about is not negated. Shamayim has vetoed the Govt’s response to your premises. Yes, by his actions, Bibi is bringing on a more drastic and horrible terrorist attack chv”s, because he is ignoring the historic opportunity just like that one-eyed bandit who gave back the keys!! Why would Hash'm want Temple Mount empty? Any ideas? Rex, TILLER's SON! Who was the tiller of the soil? So, Tiller'son must be a gilgul from Cain's line, if not Cain himself: "originator of evil, violence, and greed". So THIS is who is in charge of the State Department; Trump, you really outdid yourself! You still have the choice to expel this father of all terrorists, or YOU will be a full partner to this archetypal monster. Rex, "Roman king", does look like Esav personified, much more so than Trump himself; something about his arrogant, Roman expression; his parents knew who this Rasha was from the get go. And to think that for a while we thought Trump is a good man! To think that for a while it appeared as though he was on the road to doing Teshuvah! What happened to you, man, have you lost your mind? You better do something quick and get rid of this plague, or YOU will be directly responsible for what is about to happen. All for oil, isn't it? The FAT of the earth for you, Esav, with the help of this head of all descendants and/or gilgulim of Cain. Nice duo, nice partnership: you make me want to vomit. Only Hashem can fix this. We have to say Tikkun Chazzot these nine days, reminder. It is supposed to be a very, very powerful prayer that can work miracles. The Ben Ish Chai, in the beginning of Parshat Devarim in year 1, notes that there are 212 hours in the first 9 days of Av that are meant to be bad for the Jewish people. Although the 9 days contain 216 hours, the final 4 hours of Tish'a Be'av day are sweetened since that is when Moshiach is to be (or was to have been) born. The Ben Ish Chai interpreted the number 212 as a difficult time for Israel before the Final Redemption. The gematria of Donald Trump (דונלד טראמפ) is 424, or 212 x 2. This could be interpreted to say that Donald Trump (424) presidency will be doubly bad for the Jewish people. The gematria of Donald Trump (424), “Moshiach for the House of David” (משיח בן דוד). This should not be interpreted to say that Donald Trump is the Moshiach, but rather that his presidency will usher in the Messianic era. The numerology of Trump’s name ALSO points to one of his traits that has been especially problematic. 424 is the equivalent of כְּמוֹ-נָחָשׁ (like a snake), which is a referred to in Tehillim. Trump may have thrown us under the bus. He allowed his staff to insult Israel by claiming that Jerusalem belongs to the Arabs, not to the Jews. He sold advanced arms and weapons to the Saudis. Trump did not keep his promise to move the US embassy to Yerushalyim. And now this with Tillerson. Trump is not the only US president who has done such a thing, they all have. The US as an entity is not the friend of Israel, it is an enemy in disguise. An enemy pretending to be our friend. Just have a look at the US Jerusalem consulate FB pages, all in Arabic, not a single reference to Jews. Trump has assigned several Court Jews to do his dirty work. His administration is full of Court Jews who's allegiance is to the USA and not to Israel and the Jewish nation. So all indications point to one direction of his traits. 424 is the equivalent of כְּמוֹ-נָחָשׁ (like a snake), which is a referred to in Tehillim. ArutxSheva: "Trump to Iran: Adhere to the nuclear deal or else." Reb Dov, what say you on this? Lea, "foxes", great! I like your snappy comments. When someone knowingly harms a fellow Jew, and then returns to possibly harm or worse, the liability fall on the one who knowingly let it happen. Tort law is different, liability for knowing a dangerous event is likely and liable for the harm, even though it wasn't directly caused by the person who know of possible harm and dose nothing to safeguard. Those who caused the riots, the murders, Embassy assault, and doing nothing to safeguard the population against further harm is liable, write a letter, take to court cry to G-d.
Well, well, well, We actually do have an event that occurred during the Three Weeks that was discussed just last year on this blog. It was the second day of Shavuot in Galut, outside of Eretz Yisrael, and the Pulse nightclub terrorist attack in Orlando had just happened the night before in the early morning hours before dawn on the 1st day of Shavuot. For this discussion we will need this link to a time map from the 25th of Adar to the 17th of Cheshvan the following year as taught by the Arizal HaQodesh..... This chart can now be illustrated by the next series of my comments. So why is Tamuz, immediately following Ramadan such an opportune time to bring down the Shekhinah on to the Temple Mount?? For that we will need to do a post on the Adventures of Sag, Mah, and Ben, the gematriah 63 Name of HaShem, the gematriah 45 Name of HaShem, and the gematriah 52 Name of HaShem respectively. As mentioned by Dan G. above, Mah is from the Olam HaTikkun. According to the Arizal, these three Names above specifically manifest themselves during the Summer and Fall of the Year of Tikkun. It seems that 5776 is this very year...it seems. Sag refers to the 63 days between what was this epic Shavuot at Sha'ar HaNun and Tisha B'Av (including the Day of Shavuot itself). The Name Mah refers to the tikkunim that should take place during the 45 day period between Tisha B'Av and the 24th of Elul in the Olam Yetzirah. And Ben refers to the tikkunim that should take place between the 25th of Elul and the 17th of MarCheshvan 5777, the 52 day period between Bri'at HaOlam and the Day of the Great Flood, in Olam HaAsiyah. This Sag period (63 day period) of time between Shavuot and Tisha B'Av is one of the secrets of the Final Redemption. It seems that this 63 day period has as its primary characteristic the crumbling of the edifice of Olam HaZeh. The periods of Mah and Ben seem to reflect the beginning of building a new Messianic world order after Olam HaZeh has crumbled into Tohu. Tohu is the principle attribute of the first 9 days of Av. We shall see. We shall see. 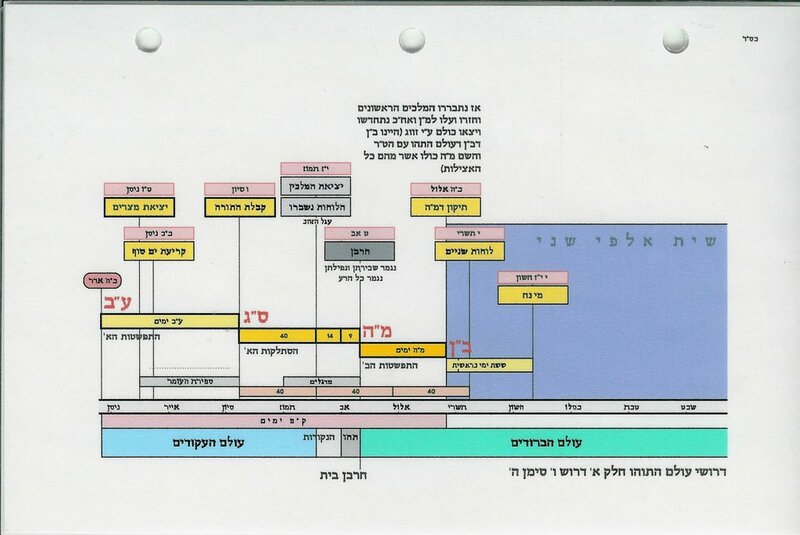 After Shabbat I will include the Ariza"l's chart (which is above) given to me by Rav Pinchus Winston a full decade ago. So there you go. When those three letters appear consecutively as HaShem's Four letter Name spelled out appear together as He fills the Four Universes, his desire for a habitation below on the Temple Mount is most pronounced, and at that time the Throne of His Full Name will be complete in the world. There are 72 days when the months are maleh between the 25th of Adar Sheini and the 6th of Siwan (Shavuot). The gematriah 72 Name of HaShem fills each day letter by letter during that time. The gematriah 72 letter Name of HaShem is spelled out letter by letter Yud Vav Dalet/ Hey Yud/ Vav Yud Vav/ Hey Yud. Yud Vav Dalet is 20. Hey Yud twice is 15 +15= 30. And Vav Yud Vav is 22. Add them up, it is 72. This takes place (or just took place) between the 25th of Adar Sheini and Shavuot because the world was either created five days before Rosh Chodesh Nissan or five days before Rosh HaShanah (1st Tishrei) depending on one's perspective. If Man had not sinned, the date of Bri'at HaOlam would have been the 25th of Adar, (this year Adar Sheini)...... OMG the Brit Milah of Netzach Binyamin Ettinger was on that very day of the 25th of Adar Sheini This is profound. If Mankind had not sinned, the lunar cycles would have been precisely 30 days and not the 29.5 days that we have now. So on the Arizal's chart Adar has 30 days so that if the world had been created on the 25th of Adar, from 25 Adar to 30 Adar is 6 days leading into Rosh Chodesh Nissan. Nissan and Iyar then have 30 days + 6 days in Siwan. That is 72 days. So the 63 letter Name of HaShem (Sag) is spelled with only one difference from the gematriah 72 letter Name of HaShem. The Vav is spelled Vav Aleph Vav. So notice the order. Yud Vav Dalet/ Hey Yud/ Vav Aleph Vav/ Hey Yud. I emboldened the three consecutive letters Aleph Vav Hey in order to accentuate the Time of HaShem's desire to dwell on Har HaBayit. Now Yud Vav Dalet is 20 days from the 6th of Siwan to the 25th of Siwan. The first Hey Yud is 15 days from the 26th of Siwan to tenth of Tamuz followed by the first Vav takes us to the 16th of Tamuz. So the Desire to dwell in His Place below in Tzion begins on the 17th of Tamuz (and lasts twelve days UNTIL THE 28th or 29th OF TAMUZ). But He only comes down in response to Aliyat Har HaBayit. As we go up, He comes down. See how that works? So Yehudah Glick's desire to restart his Aliyat Har HaBayit as an MK during the month of Tamuz is no accident. Now this does not mean that we all failed this test. Jason Greenblatt IF he tried to convince (or pressure) Bibi to remove those metal detectors failed this test. The Security Cabinet waited for him to show up before they voted on this. Chances are he may or may not of placed pressure on Bibi. So the one who really failed this test was Bibi Netanyahu, not you or me. Another Aleph Vav Hey moment is coming in Elul during the 45 days of Mah. One thing that THANK G-D will likely happen before the next 12 day window of Aleph Vav Hey in Elul will be the fall of the man who smirked at the miracle of the Arabs self evacuating themselves from the Temple Mount by trying to find a way to end their Temple tantrum. Bibi Netanyahu is going down hard. It is sad to see him screw this one up royally, but now that he has done just that, he has got to go. Even Sheldon Adelson is sick of him now. Yisrael HaYom is fuming against him. As far as the coming war with N. Korea, it is in G-d's Hands. Trump thinks he has a "few months" before FatBoy gets more accurate with his nuclear tipped ICBMs. The problem with his calculation is that every time someone guesses how many years or months FatBoy is from the the next technological leap, he gets there several times faster than anyone predicted. Trump by waiting is playing Nuclear Craps. If he guesses right, he can beat Un to the punch, but if Un gets there faster than predicted, the US mainland is in serious trouble. Derekh HaTeva, Adelson will play a big part in taking Netanyahu down... to be replaced by whom?..... Mashiach ben David? Messiah is here, acting and working, growing and blossoming, he received the plan of the Third Temple. The Third Temple is built in the sky spiritually. The righteous sleeping in ashes - are on alert! The righteous on earth – are on alert! The Merkavot in the sky – are on alert! The shofars in the sky – are on alert, waiting! Waiting for the sign, the last sign that the Creator of the world will give for the revelation of the Messiah in public! Re: the Trump/Tillerson duo: this should explain it. Really glad it's not Trump, but his opposite and adversarial alter ego: Ha-RA-she-be-Esav, Tillerson, vs Ha-Tov-she-be-Esav, The Donald. Not only is the Tiller'son The Chief of Cain descendants, if you are asking me I would think he is also a gilgul of Titus who destroyed the second Beth Hamikdash. He is still at it as we speak. There is truly a war between dark forces -Tillerson, and good forces - Trump. It looks like Trump needs our support and Tefillot after all, for success. And we need to Daven that Hashem destroy this Tillerson. One miracle at a time. Before we say chatzoth, we need to be thanking haShem for the miracle that the Muslims have not resumed "their" place on Har haBayit despite everything that has happened since they left it. I haven't forgotten that Jews have been murdered since then, either. I personally have been remiss in that in my last post I did not thank haShem directly. Perhaps this is our fault, which we can correct right now. THANK YOU, HQB"H AVINU MALKEINU, FOR THE CONTINUING MIRACLE OF THE CONTINUED ABSENCE OF NON-JEWS ON HAR HABAYIT! I think, hope and pray that at chatzos on tisha bav when we shake off aveilus we hear the shofar and ride the train to the Beis Hamikdash. And Hashem doesnt want any bodies under His House when it falls out of the sky. Reb Dov - Three months ago, what happened in our history on that date? The recent commotion regarding the Temple Mount brought a three-month-old yeshiva into the spotlight. The new yeshiva is located on the Temple Mount, and for the first time in thousands of years, Torah studies are being held at Israel's holiest site. "It's unthinkable that in Israel's holiest place, there is no yeshiva," one of the yeshiva's founders said. "We are doing everything we can to ensure that there is a Jewish presence on the Temple Mount whenever Jews are allowed to be here.” "We are the People of Israel's emissaries." Though Muslims are allowed to visit the Temple Mount freely, Jewish visitors have set "visiting hours" each day and cannot ascend the Temple Mount without supervision and a security detail. The yeshiva's students - both married and single - learn the laws of the Holy Temple in a systematic and thorough fashion. The purpose of these studies is to raise the number of Torah scholars who are proficient in the laws of the Holy Temple and ready to get to work as soon as the opportunity presents itself. During the yeshiva's summer term, students learned the laws of sacrifices, as well as the laws of Temple service according to Maimonides. "We always feel like we have special Divine aid. The verse, 'Because Torah will come out of Zion and the word of G-d from Jerusalem,' (Isaiah 2:3) is suddenly a physical reality,." Yeshiva Dean Rabbi Eliyahu Weber - a haredi man with a long and impressive lineage - teaches the students a daily class on the relevant laws. According to him, all of the yeshiva's students are either haredi or Religious Zionist. And Kiryat Arba Chief Rabbi Dov Lior granted the new yeshiva his approval. Even tourists stop to learn about the Holy Temple," Rabbi Weber said. "Some of them learn more, and some learn less." Because the Israeli authorities do not allow Jews to ascend the Temple Mount with holy books, all of the learning on the Temple Mount itself is done orally. However, the students are allowed to bring the necessary books to the Temple Mount's entrance. "Those who ascend the Temple Mount in holiness, all enjoy the fact that we have a yeshiva in this special place," visitors said. "Since the yeshiva's founding, there has been shade, drinks, and light refreshments here - and of course Torah discourse." "Spending time here is pleasant and spiritually uplifting." Could that be what exactly just happened with them getting back the Har Habayis and all of us failing away? Did I read it here - or am I confusing something else...? DS: The buck stops with the President. A previous president not so long ago understood that he can hire and fire his own staff at will even if new nominees need Senate approval, and he said that the buck stops with him. Trump can fire Tillerson any time he wants, and he most assuredly is responsible for the fact that he hired him in the first place. This was not a matter of HaShem accepting Muslim prayers as it was our Linguine spined PM capitulating before ghosts that don't even exist. Or Bibi had a more malevolent purpose in mind from his CFR training, when he just folded like an old lawn chair. He lacks Emunah, and he smirks at Divine Providence. He is unworthy to play a leading role in this conflict with Yishmael. Why G-d allowed the providential execution of his more worthy brother at Entebbe is one of the secrets of this redemption for which so many of us want an answer. We will have to ask Eliyahu HaNavi why Yoni died leaving us with this 2nd rate scheister or is it shyster? I believe it's a battle of merits between Yisrael and Yishmael. As Dov mentioned several times: according to the Zohar, Yishmael had 13 centuries to rule over Eretz Yisrael in reward for his merit of Brit Milah at the age of thirteen. They ended sometime in the 20th century. But in order for Yisrael to really take over, we must prove our own merit of Brit Milah. In that respect our generation still has a whole lot of work to do! As I mentioned in detail in the previous post's comments, going up through the Mughrabi Gate into the Southern Court of the Gentiles or going up through the Northern Gates of the Tmeple Mount from Lions' Gate Ave/Way into the Norther Ct. of the Gentiles is NOT an Issur of Kareit. One simply has to avoid the Chiel around the east- west line between the Ezrat HaNashim on the east to the Ezrat Kohanim on the west. The two Courts of the Gentiles are symmetrical. Herod was a stickler for symmetry. Symmetry is a Roman/ Greek form of Beauty. So the two gentile courts on top of the Temple Mount were/are symmetrical. When entering the Mughrabi Gate do NOT turn left toward the Golden Dome so that you can stay clear of not crossing over the Chiel. Go up with some one who knows all the halakhot and the "no go" zones where one might incur Kareit. When entering the Temple Mount abstain from relations with one's spouse for three days prior. Go to a Mikvah kosher for taharat Mishpachah on the morning before entering through the Gate. I also just recently heard that one should not wear leather of any kind when one goes up too, shoes or belts. There are a list of rules for properly doing Aliyat Har HaBayit. The Rambam did it when he was trying to make Aliyah to E. Yisrael during the Crusades. You can too as long as you stay away from the east west Chiel boundaries in the center of the compound. I don't believe that the Redemption is postponed. Let us see what happens to Bibi and/or the rest of the world before the time of Ivah (Aleph Vav Hey) in Elul. Ivah from the Aleph Vav Hey spelling is a 12 day period since that is the Gematriah of Ivah in either Tamuz and then again in Elul. It is Bibi and our secular leaders who failed the test once the Ivah came to an end on the 29th day of Tamuz. Hopefully we will have a different situation in play during the time of Tikkun in Elul. The next Ivah 12 day period is from the 12th of Elul until the 23rd of Elul during the 45 days of Mah from the tenth of Av until the 24th of Elul. Temple Mount is exploding. The Muslims are throwing stones onto the Wailing Wall Plaza. The Time of Tohu has arrived. And the PM thinks he can put his vile smelling genie back into the bottle that Greenblatt seems to have forced him to open by proposing a Gush Etzion Annexation Bill. Don't they get it. G-d has moved to the next level. The 49 years of Aliyah to the Old City, the Western Wall, and all of "East Yerushalayim" have come to an End. He wants us back on Har HaBayit. These boobie prize steps of annexation while giving the rioters their Villages are a putrid drop. They are Qorbonot to demons. Why in the h-ll does the PA deserve anything out of this? Yes, aptly worded: Qorbonot to demons. Think of it. That G-d might do in Nine Days what we could not accomplish in ten years voting for Moshe Feiglin! PM reportedly told Trump envoys he is prepared to surrender large swath of pre-1967 Israel to PA in exchange for 'settlement blocs'. A complex birth at the Hadassah hospital in Ein Kerem ended in the death of the fetus despite all attempts by the senior staff in the maternity ward to save them. You can all do that, and flood his personal mailbox with EMET. Maybe something will enter his thick, Tameh skull. Who knows, maybe we can have a little influence. He needs to hear Divrei Emet, since he is a leader of the Jewish Nation immersed in Sheker, immersed in pleasing the goyim. The Erev Rav is going down really quickly. The State may very well collapse very quickly, but the healthy seed of the holy nation waits to germinate in our holy soil. HaShem will perform this surgery as quickly as possible. The shell or husk around the holy seed needs to die so that we can breathe free. The spiritual oppression of the Erev Rav is even worse than the physical danger posed by the Arabs. Try to understand the difference between Hadassah and Sha'arei Tzedeq in relation to these spheres above. Ask yourself why is one on the verge of bankruptcy while the other is thriving? So in a deep sense, Yes Mrs. H. HaShem heard the prayers of Muslims over the Erev Rav. But that is an easy battle. The Erev Rav does not pray for the Redemption of Israel, and they don't desire it. Nor are they needed any longer. We have nothing to prove to Esav, that we are like him in any way. Esav is basically a reprobate now. So the husk or shell around Klal Yisrael is no longer needed. Good Riddance. So to whose prayers is G-d listening to in Klal Yisrael? Well for starters, let's start with Rav Shmuel Eliyahu Shlit"a and his Talmidim! As the Erev Rav collapses, the pure seed will flourish. Yes!!! Rav Shmuel Eliyahu is amazing. If you ask me, I think he could qualify for Mashiach too. He is a man of courage and truth. Who doesn't love Rav Shmuel Eliyahu? And he is coming from the Galil, isn't he??? But is he from the lineage of David Hamelech? Neshama. ...I think this is a Simon that gd is in charge of birth. Not the doctors. There is nothing else that can be expected of the secular State to accomplish which will have value and purpose in the Messianic Era unless you want to include Israel's genius for being the nerve center of the digital world. Since these three things above have now been accomplished, the secular State can now disintegrate to make way for the Messianic State. Dov, the State of Israel has not only built an amazing country, agriculture, high-tech, roads, etc. We also have a very powerful army, including the best soldiers, aircraft, nukes, missiles, etc. Everything was in vain? Why not giving all this power to Mashiach so he can use the IDF to take care of Iran, the Fakestinians and other enemies? We never had the opportunity to use all this wonderful potential! Don't tell me everything goes to waste... Israel has prepared itself to destroy the ayatollahs. We are not going to enjoy the privilege and glory to see a remake of the Six-Day War? Ginno: The accomplishments of the State of Israel, of course, do not go to waste! But the secular nation needs to morph into the Messianic Kingdom at this time so that its original purpose can be realized. If it were to remain a secular State, the Erev Rav would remain at the helm. You would then have to ask G-d, "Did we return to Zion just to eat Falafel at Ben Yehudah Mall?" Do you know how many wonderful surprises Israel has for the ayatollahs? We never had the opportunity to kick their tuches like they deserve! The IDF is unique in that its leadership comes from Qlipah Noga which can be used for both Qedushah and Profanity. We have seen it used for both: winning the 6 Day War for Qedushah, sanctifying G-d's Name, and evacuating Gush Katif for the Profaning of G-d's Name. Since Qlipah Noga can be rectified, it will be with us during the Messianic Era, and Mashiach will use it for holy purposes. Trump could have been an important instrument to Israel's salvation, one way or the other but he seems to have chosen the other. He seems to have chose to become the enemy of H' instead of His friend and will have to pay the price for it as said well by Rabbi Kessin (https://www.youtube.com/watch?v=XsH0db8lwL4). Trump may have thrown Israel under the bus. At the hand of H' Trump and his Court Jews are failing in their efforts and initiatives. Trump and his heroes are tired, and they no longer see the Middle East as a promise but rather as a milestone. The president declared that there was only one person who could carry out such a deal: His son-in-law and senior advisor Jared Kushner. The son-in-law, however, is busy proving that he wasn’t involved in a plot with Russia during the election campaign. Trump himself is busy insulting his attorney general, Jeff Sessions, trying to make him quit, and getting rid of special counsellor Robert Mueller, who is looking into his ties and his people’s ties with Russia. He isn’t firing Sessions because his electoral base wants to see him in that position. 1. The Stormy Wind: The Labor Party and its attachments to International Socialism. The Chafetz Chaim himself compared Bolshevism to a stormy wind. 3. The Flashing Fire: The Israeli Supreme Court and all of its wickedness which is to subjugate us with its pretense of dispensing justice. I have my own ideas about how the Supreme Court Building will be filled with manure with the Justices sitting in their swivel chairs of justice, suffocating in their final judgement. Oh, I would love to see all those disgusting shetulim pro-arabim reshaim of the Bagatz, NGOs, Haaretz and all the rest of the traitorous garbage burn alive before they move to their final destination in tachtit haaretz or kaf hakela. Nothing to save there. I heard that the Zohar said the Mashiach will burn the erev rav with his mouth. I already imagine all those filthy smolanim organizing on Facebook a massive protest to stop Mashiach from coming down to the kotel. But, please, Mashiach, keep for yourself the IDF and all the wonderful things Israel has built for its own citizens. Some parts of the state we can use for kedusha. The tzadikim need the roads to go to the Beit Hamidkash, technology to communicate, soldiers to protect them, farms and kibutzim to feed them, etc. Once Mashiach is revealed, the Satmer won't have any excuse to stay in shmutz lahaaretz (let's hope it won't be too late for them, since Edom is about to be destroyed forever, starting with its economy). Ah, Mashiach won't be coming to the Kotel! He will be riding his donkey onto the Temple Mount either from the East through the sealed up Golden Gate into what was the Ezrat HaNashim or through one of the Northern Gates to the Northern Ct. of the Gentiles on the Temple Mount from Lions' Gate Avenue. Mashiach's first step when he takes over the IDF will be to order the girls out of the tanks. How does one get to the women's (and men's?) places in the tunnels? My wife and I tried to get there, but weren't allowed in. They said only by paid tour. Not true. You just walk past. Say, "Tefilos," and they let you in. But if you are a woman they allow only 15 minutes and won't give you a chair. It might disturb the holy tours. The Holy Tours? Actually when I was just on a tour of the tunnels, and we were walking back to the entrance. I ran into a battalion of Police walking in the other direction. I had to really squeeze against the wall in order for them to get by me with their heavy duty machine guns. There is a problem of space down there. In some places there is tall man's headache and fat man's misery spots to squeeze through. Reap what you sow. Measure for measure from the King and Creator of the world, HKB"H! Washington, EU allies demand Iran halt ballistic activity. -when you are at the entrance you will see a guard and he will tell you to pay. Tell him that you are just coming to pray (tefila), not to tour. Then they let you in. -inside, just walk straight inside the tunnel until you get to see the women's underground shul in front of you. There you will see that before that there is a way that leads to the left. There you will meet another guard. Ask him where is the spot closest to the holies of holies for MEN. By the way, it is not true like one wrote over here that one is permitted to pray only up to 15min. in the women's spot. I have been there twice in the last 10 days. It's great. Also, last Thursday we heard police's gunshots for about 20 minutes coming from the Temple Mt. I wasn't afraid at all. The shots sounded to me like firework. :) After the shots stopped I went inside the tunnel. Until now, all of the Erev Rav and Jew hatred throughout the Globe was directed at Jewish homes and businesses, mostly in Judea and Samaria. G-d has dealt with each individual who was targeted for hate by the world. Each problem received and continues to receive His special Providence. Now the Temple Mount is the target of their Jew hatred. This relates to G-d’s future Home plans. And He is angry at those who have imperiled those plans. And if Trump and/or Tillerson had a part in trying to foil those plans, then America has a serious problem. She will likely lose the imminent war against N. Korea. And it seems to me, that His Patience is running out. So this was Bibi's big opportunity to repent. He had the 12 days of Ivah for G-d to build His Third House on the Temple Mount take place in front of his eyes,....and he royally blew it. He was likely pushed by Jason Greenblatt, whose talmudic training came from Rav Aharon Lichtenstein z"l, to cave in to the "folly" of maintaining sovereignty over the Temple Mount. The folly is in their eyes only, and it suits America's Saudi allies to insist that Jewish control over the Temple Mount is a folly. Bibi wholeheartedly caved in to the pressure. But the repercussions of his caving in will shudder around the world, shaping events and wars of Biblical proportions. Bibi is most assuredly that guy, the final pre-Messianic king, in Zecharia 12. He basically insured that he will very unlikely repent, and that Zecharia 14 will unfold instead. ב וְזֹאת תִּהְיֶה הַמַּגֵּפָה, אֲשֶׁר יִגֹּף יְהוָה אֶת-כָּל-הָעַמִּים, אֲשֶׁר צָבְאוּ, עַל-יְרוּשָׁלִָם; הָמֵק בְּשָׂרוֹ, וְהוּא עֹמֵד עַל-רַגְלָיו, וְעֵינָיו תִּמַּקְנָה בְחֹרֵיהֶן, וּלְשׁוֹנוֹ תִּמַּק בְּפִיהֶם. 12 And this shall be the plague wherewith the LORD will smite all the peoples that have warred against Jerusalem: their flesh shall consume away while they stand upon their feet, and their eyes shall consume away in their sockets, and their tongue shall consume away in their mouth. Rav Aharon Lichtenstein famously said that (as a resident of Yerushalayim) that he would gladly need to show his Israeli passport to Palestinian border guards at a crossing between Yerushalayim and Gush Etzion in order for him to go to work at his Yeshivat Har Etzion in Alon Shevut if a Peace Treaty could be negotiated with our resident population of Arab Squatters. (The Hebrew P.L.Sh shoresh means "to squat on someone else's land.") It is appropriate that they stole that ancient name for their modern gripes. Don't think for one minute that if you sit in yeshivah and listen to your Rosh Yeshivah say things like that that it won't affect your worldview. And now he is Trump's point man on such matters. Yes, Michael, by or before Hoshana Rabbah 5778, or Shmini Atzereth, the 271st day of the pregnancy that began with the French Pieces Conference of the 70 nations on the 17th of Tevet. Eliyahu haNavi will come before that Great and Awesome Day of the L-rd. ...When Michael the Prince of Israel will rise with bared arm.... At least this is what I believe. This newest N. Korean missile test is very convincing that we are on the short, but accelerated timeline and not on a three year drawn out timeline where the Persia/ N. Korean/ Russian Axis (Dubiel, the Power of the Bear) rises to take over the World in the fourth year of that timeline. The Medrash Sefer Eliyahu seems to favor that more drawn out timeline. One thing for sure, Donald Trump has a 9 month Mandate to stick to G-d's program, and he just blew it over the issue of Yerushalayim. Rome can only defeat Persia in that first nine months... even according to the Gemorrah in Yoma. Beyond that The Bears win... or are on the verge of winning. Are you saying Mashiach will be here before October? And all the preparations made by IDF to defeat the ayatollahs won't take place? According to Rabbi Yitzchak in Yalkus Shimoni, “The year that Melech HaMoshiach will be revealed, all the kings (leaders) of the nations will be struggling against each other. The leader of Persia (Iran) will contest with an Arab leader (Ruler of Saudi Arabia?) and the Arab leader will go to Aram (the Western Superpowers) to get council from them. Also according to Rabbi Yitzchak in Yalkus Shimoni: “The leader of Persia will respond and destroy the entire world. All the nations of the world will be trembling and shaking and falling on their faces. They will be seized by pains like labor pains. At this same time when the nations of the world will be struggling with each other, Iran will be threatening the whole world (including Israel), the “Time of Jacob’s Trouble” will begin and last for nine months. According to Rabbi Yitzchak “the Jewish people will be trembling and quaking and saying: "Where can we go? Where can we go?" And [Moshiach] will say to them: my children, do not fear! Everything I did I did only for you! Why are you frightened? Don't be afraid--the days of your redemption have arrived! Dov said on 7/30/2017 3:47 AM: One thing for sure, Donald Trump has a 9 month Mandate to stick to G-d's program, and he just blew it over the issue of Yerushalayim. This statement needs to be corrected or clarified. Mr Trump became the 45th US president upon his inauguration on January 20, 2017, at 5pm GMT, or 12pm local time. Hence, he still has almost two month to rectify his deeds - completing the 9 month. ...today’s ‘Sin of the Spies’ – when leadership weakens the nation, and conversely, the nation weeps and weakens the leadership, thus creating a circle of impotence, submission, and humiliation. Who asked Moshe Dayan to concede the Temple Mount? The leadership weakened the people with false claims, and now declare that the people are unwilling to fight valiantly for their sacred ideals and values, and those who are willing to fight for the sanctity of the nation and the Land, are accused by senior officers of nationalism reminiscent of the Nazis! For years, we have felt that the moral state ​​of affairs in the highest echelons of the army and the Shin Bet security service and most of the political leadership, is appalling. Their policies are void of meaning, they fail to understand the significance of the People of Israel and our vision, and consequently, fail to understand the Arabs and Islam. They accept the positions of the liberal left as if they were ‘Torah from Sinai’, and just as Obama and Kerry led the Middle East to chaos and bloodshed with such beliefs, so too, they walk blindly without understanding the profound processes that drive people, religions, and nations. I am a simple guy too, Ginno. Yet, I am not a Navi. If we are on the 9 months fast track, then yes, Mashiach should be revealed before sometime in October. (Hoshana Rabbah is around October 11th, and Shmini Atzereth is on October 12th.) If Mashiach is revealed AFTER a four year drawn out conflict described in Medrash Sefer Eliyahu, where Persia is on the verge of winning that war, Mashiach will be revealed in the Shmittah year, 5782, in 2022. G-d forbid that this should take that long because up to 2.5 billion residents of earth will die in such a war. Yet, those are the two possible scenarios with many, many unknowns and unexpected occurrences. One of the supports for that "drop dead" year of 2022 or 5782 (G-d forbid) is that that year is precisely 1335 years AFTER the laying of the Cornerstone for the Dome of the Rock in 687ce (4447), which some have characterized as the Abomination that makes Desolate over the Foundation Stone of the World in Daniel 12. Read the last couple of verses of Daniel 12 to see the significance of waiting 1335 years after the Abomination is set up. Also Rabbi Berger, the Rav of King David's tomb, recently came out and said that Nibiru should arrive no later than 5782, very likely based on that pasuk in Sefer Daniel. Based on these sources and what appears in Sefer Daniel and the Medrashim, it would seem that Mashiach should show up no later than Shmini Atzereth 5778 (in this October), BUT his kingdom won't be fully established until the War between The West (Rome) and Dubiel (Russia and Persia) is finished. The War should begin this Summer with an initial Western victory, but over the course of the next four years, THE WEST (Rome) WILL LOSE! And the son of Gigi, the slave girl in Medrash Sefer Eliyahu, will then defeat the Power of the Bear ending the last great war of human history with the Peace of the Messianic Era. So initially, "Persia will fall into the hands of Rome" creating allowing Mashiach to rise in Israel, but over the course of the next four year Rome will lose. Now Trump could avoid that possibility by repenting before Hoshana Rabbah 5778. So as usual, this is part of the conundrum. Teshuvah affects or can affect the final outcome of events as they unfold which therefore makes the final result impossible to predict. Fascinating! So the IDF is going to play a role in defeating the ayatollahs? Perhaps IDF under the command of Mashiach? Ginno: Unclear if the IDF will be employed in defeating the Ayatollahs. Since we have a mitzvah to defeat Amaeleq in the World, on one level we should play a major role in that war. Yet, the one who was supposed to lead us to victory in that war had to be from one of two tribes, Ephraim (Mashiach ben Ephraim, who is wearing a GPS ankle bracelet in New York City at this time and is confined by his parole terms from spying for Israel to house arrest after 7pm) OR Binyamin (the one who has the mantle of Shimi ben Geira as recorded in Zecharia 12, Shaul's nephew, Bibi Netanyahu). Pollard is still under house arrest after 7pm and cannot leave the United States. Netanyahu is simply a failure. He never materialized with his faith in the right place. Now Netanyahu WANTED to take on the Ayatollahs, but as we know without faith in and a firm reliance on Divine Providence, one cannot take on Amaleq in the world and win. You know the story, Moshe's hands were up toward Heaven Yehoshua bin Nun was winning. When Moshe's hands were tired and down, Yehoshua's forces were losing against Amaleq. So the question might be that if Mashiach ben David is from Yehudah, not Yosef or Binyamin, how can he defeat Amaleq in the World? Frankly it was not supposed to be his job. The previous guy, Bibi with the Netzitzot (impure sparks that were meant to be purified) of Shaul HaMelekh in tow, blew it. So it seems that the two forces of Amaleq in the world (one in Western Europe whenever a united Germany is united with the Vatican as it is in the E.U. and one in Persia), will have to kill each other in this last great war. May it happen quickly and not be a four year long dragged out affair. And this time, Bibi was given a chance to "complete the Name of HaShem" in the world even without defeating Amaleq in the World! Remember? Because Amaleq is in the world, the Throne of HaShem and His Name are incomplete. The Incomplete Throne and His Name are called Keis Y-H. The Throne is missing an Aleph to turn Keis into Kisei, and HaShem's Name is missing a Vav and Hey. Well, the 12 days of Ivah (Aleph, Vav, Hey) and a proper response to it would have completed the Name of HaShem in the World! The War against Amaleq would have been miraculous because His Name and His Throne would have been complete in the World even BEFORE the Final War. So now we see, that the Final War will already be bloody because of his failure. General Kelly is now Chief of Staff.... We are on the verge of WW3. Nikki Halley and others in the Trump White House say that the time of Talking or Diplomacy is Over. Mashiach willnever lead the IDF. The army that follows Mashiach will not be designated a purely defensive posture. It will go on the offensive and it will conquer and there will be no "giving back" the spoils of his wars. Furthermore, Mashiach's army wil not have women. It won't have goyim. It won't have gays or transgenders and it won't have seculars. Like David Hamelech's army, every member will put on tefillin in spirtual and physical purity and wear it into battle. R' Dov, what does this mean? I don't know when, but what I do know is this "stuff" is escalating and quickening its pace. Now China too is finished. The King and Creator of the world will see to that. North Korea has now put their submarine out into international waters and it's thought to have a new upgraded missile launch test pending......How much more will this guy go? And what was Jason Greenblatt's position on this? Netanyahu waited until Greenblatt arrived in Israel and came to him for consultation BEFORE holding the late night Cabinet meeting to remove the metal detectors and the security cameras at the Lions' Gate on the 2nd of Av. It should be noted that these words from Kushner were meant to be confidential discussions with Congressmen, but someone broke the law and released a recording to the Press. I am very happy to see that at least Kushner is clean on this. I reread the HaAretz article which frankly is very hard to do because it is IN HaAretz, and it is clear to me that Jared Kushner agreed with the decision to place metal detectors and security cameras at the entrance to the the Lions' Gate Avenue entrances to the Temple Mount, but he seems to have been overruled in order to "placate" the Arab Street in Jordan and in Israel. So someone in the Trump Administration decided to cave into Arab pressure on this matter and to get Netanyahu to cave on this matter, and it was not Kushner who wanted him to cave so it seems. They did not want an explosion probably because Donald Trump is trying to build his Sunni Arab coalition against Iran and because of the Arabist leanings of his Secretary of State. So there are still many open questions. But again I must stress, this speech or discussion with Kushner was illegally leaked to the Press. There is most assuredly a lot of that going on these days. Well It seems that 1500 Jews attempted to enter the Temple Mount compound through the Mughrabi Gate on Tisha B'Av. The WAKF was so overwhelmed by this record barrage of Jews that the Police only allowed 1000 into the Southern Courtyard. This is one of the positive results of the 12 days of HaShem's desire as it played itself out through "natural events". This adds to the "mystique" of those events which lead up to the Arabs self-exiling themselves from the Temple Mount until Netanyahu caved in on the 2nd of Av. THAT explosion of interest in Jews wanting to do Aliyah Har HaBayit is surely what G-d wants to see. So on the issue of Kushner, one has to ask why would someone want to leak Kushner's confidential meeting with Congressional aides to the Press? The answer is to undermine his credentials in the eyes of the Saudis. The Saudis will now tell Trump that Kushner is not an honest broker, even if he really is, and will place pressure on Trump to appoint someone more Arabist to force Israel to accept Saudi final status terms. Make no mistake, but the leaker wants Kushner to be fired in order that someone else take his place to put more pressure on Netanyahu to cave ..... because Bibi is very good at caving. Now how will Trump then respond to such Saudi pressure when he is being told by Tillerson and Mattis that the US needs Saudi cooperation against Iran? Since the Persians are the N Koreans number one ally now, the US needs the Saudis to cooperate more than ever. Can anyone else see where this is leading? The leaking of Kushner's true thoughts had diabolical intent behind it. It explains Trump's personal silence in dealing with our crises from the last two weeks. He is hearing conflicting reports from Tillerson and Kushner and likely does not know how to respond yet. With all the spiritual and earthly problems of Am Israel, it might seem silly to complain about this, but I'm upset that Israel has prepared itself for the last twelve years to give the ayatollahs a remake of the Six-Day War, but now apparently the US is going to take care of the job together with the Saudis, which means Israel will probably have to make suicidal concessions to the Fakestinians and the IDF will not participate in the war. All the preparations, training and billions of dollars will go to waste. We can't even take care of our Temple Mount. I think Bibi is not even shomer shabbat, so I don't expect him to have emunah to do what he should have done long time ago. That's the problem when you don't have Torah knowledge. You can have a Harvard degree and patriotic intentions, but you will behave like the most stupid leader in the end. If Mashiach is waiting for Am Israel to solve its own problems, when the time comes he won't have a minian of tzadikim to receive him. It will be too late. The sinat chinam, the sins, the materialism and chillul Hashem are only getting worse in this generation. It's sad when you realize that for every baalei teshuva that someone like rabbi Yosef Mizrachi or Zamir Cohen make, you have many other children going off the derech. Seriously, after 2,000 years of bitter exile, Holocaust, pogroms, crusades, assimilation, immodesty, internet and esther panim... what did you expect, Hashem? It's hard for me to blame the Jews. Why Mashiach couldn't come during the Middle Ages, when most Jews were shomer mitzvot and were ready to die for Your name? Hitting the Jews with tragedies doesn't seem to solve the problem. Isn't that obvious at this point? Honestly, I can't see a solution for this. What's the point of waiting for Mashiach when at least 80% of Am Israel will get destroyed for not keeping Shabbat and basic mitzvot? If my entire family gets wipped out when salvation comes, I will curse that day. I won't be happy, I promise you. As a matter of fact, I don't want to live without my parents. But before I leave this world, I want to see the final revenge against the enemies and haters of Israel around world. At least I'll leave with a smile. Dov asked " Can anyone else see where this is leading?" I do. Since the trend is that Trump is turning more and more into a "Snake" he will in the end get rid of Kushner and Greenblatt and all the rest of the Court Jews in his administration. There has been a “massive increase” in anti-Semitic incidents in the United States, according to the Anti-Defamation League’s (adl) annual Audit of Anti-Semitic Incidents released on Monday. Last year, adl recorded 1,266 incidents compared to 942 in 2015—a 34 percent increase so Trump will have popular support going against the Jews. Trump allowed his staff to insult Israel by claiming that Jerusalem belongs to the Arabs, not to the Jews. He supported the removal of the security arrangements on the Temple Mount. He supplied large amounts of arms and weapons to the Saudis. Trump sees himself as the author of The Art of the Deal. The Arab-Israeli conflict is the ultimate deal in the sense that this is the most complex and intractable international question. There are so many parties involved, including the great powers, the regional powers, the Islamic states, the Jewish community, and the other religious communities. It is the ultimate prize to get a Nobel Peace Prize. There's nothing comparable to it, nothing as complex and long lasting. Hence, I believe that Trump will turn against Israel, seeing it as the intractable party because that is what often happens. Look at Jimmy Carter and Barack Obama: they make efforts and they get frustrated that the Israelis don't give more because there is an enduring belief that if only the Israelis gave more, the Palestinians would relent and stop being rejectionists and everything would be fine. And we all know that there can be NO peace with the inherent haters and enemies of Israel - the Muslims and the Arabs. Yes, so based on the the Gematria/numerology of Trump’s name 424 is the equivalent of כְּמוֹ-נָחָשׁ (like a snake), which is a referred to in Tehillim. So Trump will turn into a "Snake" and go against Israel and Jews in general unless he will make Teshuva/Repentence within two month or as Dov expresses it, "unless he sticks to G-d's program". LinkedIn on Ashley Feinberg. She's Spanish and probably Jewish. Wonder if there is a tie to Hil? Al Monitor: By now it is obvious that the “ultimate deal” between Israelis and Palestinians, which President Donald Trump promised in his first days in office, was little more than an optical illusion. A series of conversations with Israeli, Palestinian and diplomatic sources depicts a very different picture. The diplomatic process is bogged down. President Trump is not involved in any way, nor does he have any interest in getting involved. Palestinian President Mahmoud Abbas is severely disappointed with the United States, and the US “peace team” has lost what limited credibility it had on the Palestinian side. Meanwhile, Prime Minister Benjamin Netanyahu’s right-wing government is rubbing its hands eagerly beneath the table and dismissing all the serious concerns that sullied the mood of the past few months. Nothing will happen, because there is nothing there. My comments:: It was bound to happen. President Trump has missed out on the blessing of Avraham for himself and the USA. Mr. Trump got caught in the ultimate deal from day one. In the early days of his presidency, he met with Abdullah II of Jordan, el Sisi of Egypt and Salman of Saudi Arabia. Together, the three most powerful Sunni leaders in the world convinced the president that peace was possible. It was taqiyya – a lie. David Freidman, Jared Kushner, and Jason Greenblatt were largely absent during the Temple Mount crisis last week. It is a familiar story. Every president since 1967 has said they would move the US embassy to Jerusalem, including Barack Obama whose love affair with the Muslim Brotherhood made his intentions sound ridiculous. Trump has done much good in 8 months. He would do well to remember that without G'd’s blessing his presidency will end up a failure. How come we haven't made any progress since then? You can always ask Ashley Feinberg what her motivations are? The Times of London has two main articles. 1.) Bibi's former Chief-Of-Staff Ari Harow is in negotiations to give evidence against Bibi in the corruption enquiries. Today is the annual “Parade” and in conjunction therewith, DEATH THREATS HAVE BEEN MADE TO HARAV SHMUEL ELIYAHU, because of this article HaRav Eliyahu. The Arabs have prophets and sorcerers from the power of impurity, who know that they are in great distress and they prophesy the power of impurity and say to them: 'You have no place in Jerusalem, on the Temple Mount! That's the place of the Jews! 'This is the reason everyone is going wild and wants to be present. Messiah acts and works, turns around twenty-four hours a day, protects the walls of Jerusalem, protects Israel's borders. Most of them know him, Jews and Gentiles, some are afraid to discover him. Clear signs speak of Messiah. Messiah is in our time, in our generation, and will be revealed any moment! We are waiting for the Holy One, blessed be He, to open the revelation of the King Messiah in public, there is no return! There is a war for the Temple Mount, the Holy One, blessed be He, will turn the tables around and the building of the Third Temple will begin! The United States, Trump is preoccupied with his affairs, says the Holy One, Blessed is He: "Anyone who interferes with the Jews in the holy Land of Israel will be beaten hard by the Creator of the world – with the ten plagues." It's easy to get frustrated with him for not being as effective against the "deep state globalist network of Edom," but he is certainly holding them at a STALEMATE. Therefore, according to the gematria of 'snake', he is holding back the 'snake' from getting its way until Hashem finishes it off on Yom Hashem. He may also be playing a role in the protecting or supporting of the 'Mashiach ben David' (another gematria of Trump's name) who will be revealed before or certainly after Yom Hashem. Rather than waiting for Moshiach, Israel should be waiting for Hashem! After Yom Hashem, all of the wicked will be destroyed, the wayward will be humbled, and the righteous ecstatic. HaKadosh Baruch Hu will reveal his servant (Moshiach), and then His people can move forward in establishing a Torah kingdom for Hashem. Israel must stop waiting for a human solution or savior, and look up, for the Day is near! Loved Shilo ben Adam's comment. Yasher Koach! He's absolutely right! Only Hashem can help. Man will now be humbled and realize Ein Od Milvado! I am not sure that Trump's hands off policy on forcing a settlement on Yesha's final status qualifies him as being a snake. If that policy is coming from Kushner, then Kushner should be lauded for not trying to solve a problem for which only G-d has a solution. On the issue of the Temple Mount, the pressure to remove those metal detectors very likely came from Trump via Greenblatt, but it was done to prevent WW3 from exploding before the US was ready to fight it against N. Korea and Iran. But the pressure came at our expense because we have to live with the fact that our enemy thinks our PM is a coward who cows before the shedding of Israeli blood. For that, we pray that HaShem speeds up the process, rather than slowing it down because on the Temple Mount, it is His House whose construction is being delayed by the nations of the world including the US, not our houses. It is where He places His Name that has been profaned by us throughout history. The other issue with regards to the Temple Mount is that Trump does want to force a rapprochement with the Sunni Yishmaelim and their Persian Gulf kingdoms and the Kingdom of Yarden, a rapprochement which is in the Sunni Yishmaelim's best interest, which overrides our need to have a modicum of self-respect. He may be doing it for his alliance against Iran, but when issues like the Temple Mount security measures comes up, he is instinctively siding with Sunnis over us. In his mind it is in America's best interest to do that. So Netanyahu should resist that because his surrender and capitulation on that issue puts our lives at risk, and it cheapens the life of all who died during their Temple Tantrum. But Ole' Linguine Spine doesn't put up much of a fight on these matters. This is one of the reasons why we need the flesh and blood Mashiach too because our present flesh and blood leader is behaving like a cadaver by refusing to resist basic insults to our humanity which thereby allows our enemy to treat us like the apes and pigs that they think we are. I actually like and respect Alan Greenspan more than the other pool of lesser Central Bankers. For him, controlling the money supply is a science not just an art. So this prediction should cause one's hair to stand on end. Now he gives no time frame, but if the US and world economy now are finally growing in real terms, then interest rates will simply need to go up soon. But this time, the world economy will snap under the pressure. The Debt levels are simply too high already to deal with rapidly rising interest rates. SEVEN DAYS IN MAY. According to this video, a COUP is in progress against President Trump - Alex Jones and Roger Stone about the COUP. Roger Stone joins Alex Jones live via Skype to discuss how the deep state and top generals in Trump's Administration are working to isolate the President from intelligence before staging a coup to overthrow him from power. The Generals, McMaster, Kelly, and ? are cutting off communications channels. See McMaster Purging Key Trump Allies. It seems that Kelly (and a woman he brought along with him) are working against Trump also. This is horrific! A South American Style Presidential Takeover in Progress….
" a rapprochement which is in the Sunni Yishmaelim's best interest, which overrides our need to have a modicum of self-respect. He may be doing it for his alliance against Iran..."
She suggested that Trump replace McMaster — or else Israel might begin to reconsider its embrace of Trump:If McMaster isn’t fired after all that he has done and all that he will do, we’re all going to have to reconsider Trump’s foreign policy. Because if after everything he has done, and everything that he will certainly do to undermine Trump’s stated foreign policy agenda, it will no longer be possible to believe that exiting the nuclear deal or supporting the US alliance with Israel and standing with US allies against US foes — not to mention draining Washington’s cesspool – are Trump’s policies. How can they be when Trump stands with a man who opposes all of them and proves his opposition by among other things, firing Trump’s advisers who share Trump’s agenda? Are we seeing the play of the Snakes or what? Meir: What we are seeing is Divine Providence at work. When John Kerry forced Israel to release 3 sets of 26 murderers during his famous nine months of "negotiations" with the fourth one being canceled, 3/4 of the nine months that were decreed upon Israel already occurred in 5773 - Adar of 5774. So we ONLY have to suffer for the last quarter of the nine months in this go around! 3/4 of 9 = 2 months + about one week. That takes us from around now until Hoshana Rabbah. So Rejoice rather than talk about snakes! Dov, that is pshita. Everything is Divine Providence. Nothing moves without the consent of the the King and Creator of the world, not even a fly. My topic is about Trump and his administration. Is he the Moshiach of Esau or is he Snake-like when it comes to Am Yisroel and Eretz Yisroel. We are trying to interpret events from a human perspective and understanding. The Divine calculations and actions are well above our intelligence to even grasp. Could you please do a blog piece on the upcoming Great American Solar Eclipse, which will occur on August 21st, 2017 - one day before Rosh Chodesh Elul? I would be interested to see what you say about it. Well, Meir, the P'shat in the Navi is that HaShem during the last nine months wants to bring the nations of the world against Yerushalayim for battle. So that part is not beyond our human understanding. And therefore that part should be celebrated. There is light at the end of the tunnel! Dov, so we agree: Mere mortals cannot solve the 3500-year-old blood feud between Ya'acov, whom G'd called Israel (Bereshis 35:10), and Esau, whom G'd called Edom (Bereshis 36:1). But before this final battle there is Daniel 9:24-27. What do you make of that? The seven weeks and the "false peace"? כד שָׁבֻעִים שִׁבְעִים נֶחְתַּךְ עַל-עַמְּךָ וְעַל-עִיר קָדְשֶׁךָ, לְכַלֵּא הַפֶּשַׁע ולחתם (וּלְהָתֵם) חטאות (חַטָּאת) וּלְכַפֵּר עָו‍ֹן, וּלְהָבִיא, צֶדֶק עֹלָמִים; וְלַחְתֹּם חָזוֹן וְנָבִיא, וְלִמְשֹׁחַ קֹדֶשׁ קָדָשִׁים. 24 Seventy weeks are decreed upon thy people and upon thy holy city, to finish the transgression, and to make an end of sin, and to forgive iniquity, and to bring in everlasting righteousness, and to seal vision and prophet, and to anoint the most holy place. כה וְתֵדַע וְתַשְׂכֵּל מִן-מֹצָא דָבָר, לְהָשִׁיב וְלִבְנוֹת יְרוּשָׁלִַם עַד-מָשִׁיחַ נָגִיד--שָׁבֻעִים, שִׁבְעָה; וְשָׁבֻעִים שִׁשִּׁים וּשְׁנַיִם, תָּשׁוּב וְנִבְנְתָה רְחוֹב וְחָרוּץ, וּבְצוֹק, הָעִתִּים. 25 Know therefore and discern, that from the going forth of the word to restore and to build Jerusalem unto one anointed, a prince, shall be seven weeks; and for threescore and two weeks, it shall be built again, with broad place and moat, but in troublous times. כו וְאַחֲרֵי הַשָּׁבֻעִים שִׁשִּׁים וּשְׁנַיִם, יִכָּרֵת מָשִׁיחַ וְאֵין לוֹ; וְהָעִיר וְהַקֹּדֶשׁ יַשְׁחִית עַם נָגִיד הַבָּא, וְקִצּוֹ בַשֶּׁטֶף, וְעַד קֵץ מִלְחָמָה, נֶחֱרֶצֶת שֹׁמֵמוֹת. 26 And after the threescore and two weeks shall an anointed one be cut off, and be no more; and the people of a prince that shall come shall destroy the city and the sanctuary; but his end shall be with a flood; and unto the end of the war desolations are determined. Meir, with all good intentions, the Torah says that in the “End of Days” even children will be able to (prophecy) see the signs of Mashiach coming. So, please, only speak for ‘yourself' about such things being “well above our intelligence to even grasp”. (your comments sounds like ‘rote knowledge’ and not an independent thinker). Even Lea has great insights. Chevra, let's try and be a little less critical of our fellow commentators. I think it will take till the end of Hanuka, for the last birur. Neshama, and who are you evaluate what kind of knowledge I have. Maybe you already have reached prophetical knowledge? Yes, this is my opinion and your parenthesis comment what out of line. You don't even have to be a Rabbi to figure this possibility out. I was thinking the same thing, even before this most recent alignment. For example; Qatar financed ISIS, but Iran is fighting ISIS, yet Qatar is friendly with Iran. Russia is definitely fighting Isis with other Muslim fighters from Caucasus, and is in talks with USA on several issues. They fight together now, yet have put sanctions on each other. Let's all forget that USA might at one point have sent weapons to ISIS or Al Nusra atleast. Some rebels in Syria get medical treatment in Israel. Israel little friendly with Gulf States now, really? Am not even talking Turkey here, who seem to take pride in being friend and foe with each and every party at the same time. This seems to be Erdogan's official policy. Europe has been taking refugees from Iran for years, but at this time is literaly cosying up with the regime in Tehran. And so on, and on. Ok, guys, let us discuss just the topics at hand, not what we think might be the motives behind the Comments. Meir: I will look into it, but I believe that Rashi says that that final 70th week was the Shmittah cycle of the Bar Kochba Revolt. His Revolt was successful for half of a cycle, 3 1/2 years. I will look into it. The world has shown their preference for Iran over Israel. They want Iran to be normalized in the family of nations while even Trump's Generals want to ostracize us. So they have normalized Iran and are overlooking the elephant in the room. The Persians are financing and technologically assisting the N. Koreans on their nuclear program! And the entire world has such a desire to overlook that fact. They are down on their guard from the real danger BECAUSE they want to normalize Iran into the family of nations. And this is what will precisely be their undoing, and it won't take very long because whatever research on missile technology through Iranian funding is going on right now is what is helping to propel N. Korea's nuclear missile program forward at lightning speed. This is a Grand Master Plan of Divine Providence. The nations, including Trump's Generals, prefer the Persians over the Jews to be in the family of nations. And the Persians therefore by ignoring them become the agent of their destruction. I just pray that the turn around time is in two months and not three years. Every headline now says the Same thing. Suddenly, N. Korea can miniaturize nuclear warheads to fit on all of their missiles! Let us be honest with each other. Not only is this not sudden (they have been working on this for years), but in the world's eyes there is an "unknown factor" behind N. Korea's lightning like advances in its nuclear weapons program. They can't figure it out. Kim Jong Un in the last two years (coincidentally since the signing of the Iranian nuclear deal) has advanced his program faster than a speeding bullet. And the World of Reprobates can't even figure out why, lest they point a finger at themselves, for they themselves have equipped Evil in the world to ensure their own demise. Wicked Scum. From Francois Hollande to General HR McMaster. Guilty. Guilty. Guilty.. And it seems that over Sukkot a certain Court decision will be handed down on the Nations of the World. Meir: You sent a photo link to Comments which includes some inappropriate images in the advertisement area of the page. So I can't post your Comment. Well Mark, I guess this blog was right after all. GogUMagog by Sukkot 5778 at the end of the Nine Months. And now that Trump has fully brought on McMaster into his inner circle and defended his actions, Trump and the United States are in serious peril of losing the War against North Korea!. If Trump had attacked N. K. by the 17th of Tamuz, he probably could have won. Now that he will be forced to attack on or BEFORE Hoshana Rabbah 5778 when Kim Jong Un is in a better military position, the US is most assuredly NOT guaranteed that it will be victorious. Every American Jew should at least have plans to vacation in Israel from Rosh HaShanah through Sukkot. Of course that is my educated opinion, not a prophesy. Perhaps every Jew in the world should plan to be here at that time too. This war will be Global even if it starts between the US and North Korea. I was not so sure about any of this until today. Today so much was crystallized and clarified. It is clear to me that the Iranians are the main reason behind Kim Jong Un's leaps in nuclear and missile technology, only because the world freed up the Persians in their hope of isolating Israel. So the monster that they created to destroy us will now destroy them. The Zohar haQodesh says that it starts with the nation at the edge of the world. One does not have to go any further than that. The Zohar says that it starts there and ends in Batzrah in Iraq. So the Zohar, in this way, itself weaves North Korea with Shiite Iran and Southern Shiite Iraq. The Zohar points to a three month war. For 400 years Eretz Yisrael was emptied of Jews from around 200ce until 600 ce. Yishmael was given E. Yisrael for 1300 years for each year he was when he accepted Brit Milah from around 620 - about 1920 ce. Keep in mind that this is the short version of the explanation of this Zohar. I have done a precise calculation in previous posts. Another 100 years of argument between Yaakov and Esav over the Land of Israel with Esav wickedly saying that he takes half of it for a mythical country called Palestine, Eretz Yisrael's Roman name. Then at the time of Yitzchak's brit milah, the argument would be decided after that last 100 years corresponding to the one year from Yishmael's brit milah and the birth of Yitzchak. There were to be three final wars of GogUMagog AFTER WW1 and WW2. The First Persian Gulf War was a bombing of Sadam Hussein from the Sea by Gog HW Bush Sr. The Second Persian Gulf War would be "by land" over the same Iraq by his son, Gog ben Gog W. Bush Jr.
And the third war would come after Israel is forced to remove metal detectors preventing wicked Yishmaelim from ascending the Tempe Mount, "around Yerushalayim." That decision came from either Gen. McMaster or Gen. Kelly, not sure which. Netanyahu was ordered to stand down....or else, whatever you can threaten a man with a Linguine Spine, Netanyahu was likely threatened to capitulate. But since this was the entrance to G-d's real estate, not ours, His response is immediate. So the 3 month war will soon commence. Nothing is ever simple. As seen from above, This took a long time to reach this point. Bibi was commanded from the Torah to take care of the "sheep of Yitro" a covenant between Yitro and Moshe from 3300 years ago. So he put up metal detectors after they were murdered. Moshe was called to the Mountain of G-d to see the Burning Bush in Tamuz's waning moon because he was taking care of Yitro's sheep. The First Redemption starting with the Burning Bush was with the Yud and Key in HaShem's Name. The Final Redemption is with the Vav and the Key from Ivah which we also discussed before happens at the same time during Tamuz during the Final Redemption. I linked to the Arizal's chart above in Comments. It also begins with being "called up to the Mountain of G-d", but this time it is the Temple Mount. at the time of Ivah, during the 12 days of Aleph Vav Hey in the days of Sag in the chart above. Bibi did not handle being "called up to G-d's holy Mountain" very well. So now G-d is angry... but not at just him. He is angry at every world force that has bothered themselves with dividing Yerushalyaim for the last 100 years when the debate was with Edom and when Yishmael had already lost control of the Land. And that is the wicked Rome in our Zohar. So the country at the edge of the world has now arisen.... pretty spectacularly I must say. If I were you, and I know I am not you, I would at least plan an Israel vacation for the month of Tishrei... just to be on the safe side. Great post and great comments. The world is headed down the abyss, there is no way around it now. My comments will add nothing to what has already been said here. Again I humbly ask, if the topic interests you - what are your feelings on the upcoming GREAT AMERICAN SOLAR ECLIPSE that is coming up on the 21st of August? I would imagine you have very specific thoughts on this event and the ramifications it spells for America. UK papers are reporting that North Korea is considering a strike against American military facilities on Guam. First American governor of Guam was Jewish, Edward D Taussig, from a family who were from the early to mid 19th century immigration to America of German and Austrian Jews. So we, the unitiated at the outside, don't really know, what goes on inside at all those meetings at UN or G8 and the likes. And we certainly don't know all the sometimes dirty secrets at the backside. And that has been going on for centuries. Maybe it is all a play? What do they care of all the dead people in Syria, and who is fighting who for what doctrine? It is not their doctrine ! They just devide and conquer, and stay in power, and keep the masses happy. Boycot of Qatar, really? Iran friend with Qatar, how does that add up then? Recoqnition of Israel, really? Israel is just the change in a Heglian dialectics kind of way. Russia messing up the elections? Are you kidding? Isis emerging out of nowhere? Guys taking flying lessons and nobody notices? Send by cavemen? This is perhaps all a set up. Even back in 2004 i read on Xtian sites that probably this Iraq war was for Bush to get his army on Israel's border. That moment has now arrived ! Trump in charge? Are you naive? So but, it is a play by HaShem in the end. We are inside the tzimtzum, and that is not perfect, and it is all His Dream, a kind of a play. And the powers that be, know this to a certain extend. They know scripture, they know prophecy. Even Bob Marley sang about that. They got to fullfill the book. Or not, their version of the book, anyway. Haim: Yes, I will be writing about the molad for Elul solar eclipse. The solar eclipse's northern edge of totality is supposed to split North from South St. Louis through downtown St. Louis right through the legs of the Gateway Arch, I believe. It is downright bizarre. The Jewish community in University City which will be under totality for a grand total of about 10 seconds, (since it is on the northern edge of totality), is excited about this, but of course members of the U. City Kolel know the spiritual dangers of a solar eclipse involved to their world in the Galut. I would not be so excited about it. Anon: Yes, as LondonMale previously pointed out the Final Great War of GogUMagog likely began when the N. Koreans shot off their first ICBM missile on the 10th of Tamuz 5777 at the very beginning of Tekufat Tamuz, the last three month period of the Jewish Year from the Tenth of Tamuz until the Tenth of Tishrei aka Yom Kippur 5778. Was that intentional? Their logo has the Gateway Arch going thru the "Kollel" which seems to mimic how the eclipse will be seen there?! And yes, why "celebrating"? Why would one celebrate such an earth-affecting phenomenon? I would like to know the astronomical explanation of this eclipse visavis what our Sages of old saw in this. Awaiting your discussion on this. As I alluded to it, the members of the S. Louis Kollel may be excited about it because it is a once in a lifetime event, but I doubt that they will be celebrating it. I know some of these Rabbanim. They are ehrlich enough to know that there are dangers in Galut from such an event which might portend the disintegration of the United States..... might... or in the case of S. Louis, a Civil War between "North" and "South". For those who likely don't know, Ferguson is a northwestern S. Louis County suburb. I just posted a new post about the Fire and the Fury of 5777. Please move all discussions over to that new post. I am sorry, that David Matlaw's comment detailing the Net Worth of esteemed Rabbanim was published. I was trying to publish something else, but the mistake is mine.